1/2 ounce Bottle Dropper (18-400). This dropper fits our 1/2 ounce glass bottles. 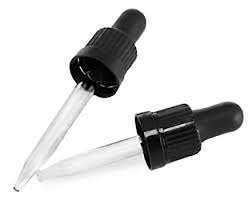 We also carry the dropper that fits our 1 ounce, 2 ounce and 4 ounce glass bottles. Bottle dropper fits our 1/2oz glass bottle with a Cap Size 18-400 Length 2-9/16"
Perfect size for mixing essential oils! Easy shopping with professional Seller!